If you are feeling a bit lost after the apocalypse, why not mosey on over the Georgia in the United States and see the Georgia Guidestones? Often called the America Stonehenge, these huge slabs of granite contain 10 messages in whole heap of languages if your mother tongue isn't English. Blow is the first page from the article "American Stonehenge: Monumental Instructions for the Post-Apocalypse". The strangest monument in America looms over a barren knoll in northeastern Georgia. Five massive slabs of polished granite rise out of the earth in a star pattern. The rocks are each 16 feet tall, with four of them weighing more than 20 tons apiece. Together they support a 25,000-pound capstone. Approaching the edifice, it's hard not to think immediately of England's Stonehenge or possibly the ominous monolith from 2001: A Space Odyssey. Built in 1980, these pale gray rocks are quietly awaiting the end of the world as we know it. 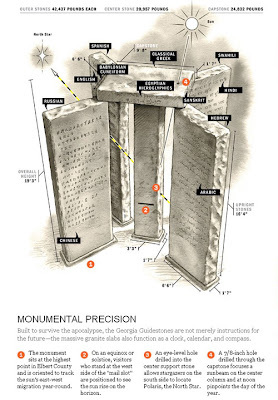 Called the Georgia Guidestones, the monument is a mystery—nobody knows exactly who commissioned it or why. The only clues to its origin are on a nearby plaque on the ground—which gives the dimensions and explains a series of intricate notches and holes that correspond to the movements of the sun and stars—and the "guides" themselves, directives carved into the rocks. These instructions appear in eight languages ranging from English to Swahili and reflect a peculiar New Age ideology. Some are vaguely eugenic (GUIDE REPRODUCTION WISELY—IMPROVING FITNESS AND DIVERSITY); others prescribe standard-issue hippie mysticism (PRIZE TRUTH—BEAUTY—LOVE—SEEKING HARMONY WITH THE INFINITE). 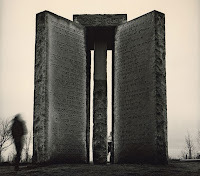 What's most widely agreed upon—based on the evidence available—is that the Guidestones are meant to instruct the dazed survivors of some impending apocalypse as they attempt to reconstitute civilization. Not everyone is comfortable with this notion. A few days before I visited, the stones had been splattered with polyurethane and spray-painted with graffiti, including slogans like "Death to the new world order." This defacement was the first serious act of vandalism in the Guidestones' history, but it was hardly the first objection to their existence. In fact, for more than three decades this uncanny structure in the heart of the Bible Belt has been generating responses that range from enchantment to horror. Supporters (notable among them Yoko Ono) have praised the messages as a stirring call to rational thinking, akin to Thomas Paine's The Age of Reason. Opponents have attacked them as the Ten Commandments of the Antichrist. Whoever the anonymous architects of the Guidestones were, they knew what they were doing: The monument is a highly engineered structure that flawlessly tracks the sun. It also manages to engender endless fascination, thanks to a carefully orchestrated aura of mystery. And the stones have attracted plenty of devotees to defend against folks who would like them destroyed. Clearly, whoever had the monument placed here understood one thing very well: People prize what they don't understand at least as much as what they do. The story of the Georgia Guidestones began on a Friday afternoon in June 1979, when an elegant gray-haired gentleman showed up in Elbert County, made his way to the offices of Elberton Granite Finishing, and introduced himself as Robert C. Christian. He claimed to represent "a small group of loyal Americans" who had been planning the installation of an unusually large and complex stone monument. Christian had come to Elberton—the county seat and the granite capital of the world—because he believed its quarries produced the finest stone on the planet. Joe Fendley, Elberton Granite's president, nodded absently, distracted by the rush to complete his weekly payroll. But when Christian began to describe the monument he had in mind, Fendley stopped what he was doing. Not only was the man asking for stones larger than any that had been quarried in the county, he also wanted them cut, finished, and assembled into some kind of enormous astronomical instrument. What in the world would it be for? Fendley asked. Christian explained that the structure he had in mind would serve as a compass, calendar, and clock. It would also need to be engraved with a set of guides written in eight of the world's major languages. And it had to be capable of withstanding the most catastrophic events, so that the shattered remnants of humanity would be able to use those guides to reestablish a better civilization than the one that was about to destroy itself.